I’ve been exploring new fragrances for a while now but feel a little nervous to fully commit to full bottle of a new perfume. The TOCCA collection at Etiket recently caught my eye. 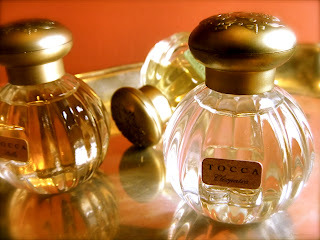 I’m not sure if it was the beautiful packaging or the Old World inspired bottles, but I found myself very drawn to all 6 of the TOCCA scents. 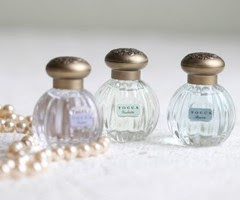 Before investing in a full sized bottle, I decided to try 3 different eaux de parfum from the Viaggio Collection. This set includes Colette, Bianca and Giulietta – 3 very flirty and feminine fragrances. Named after the Italian word for “touch”, TOCCA Beauty is renowned worldwide as a fragrance house of distinctive and exquisite scents. Its perfumers develop scents that are reminiscent of bygone times and familiar places yet infused with the unexpected, creating something fresh and new altogether. Leaving a touch of mystery in the air, TOCCA’s sophisticated products are meant to inspire and surprise. TOCCA’s beautiful fragrances can be found in a luxury candle collection, fine fragrances, and body products however my favourite unique product is the solid perfume intended for the sophisticated traveler.